This post about the Nordstrom Summer 2018 Anniversary Sale and 2 more sales to shop this weekend contains affiliate links. Please read this blog’s disclosure post for more info. Keep Summer easy and breezy, with this lovely dress at an extra 50% off. If you’re ready to do some shopping this weekend plenty of deals await — including the public debut of the Nordstrom Summer 2018 Anniversary Sale! Let’s take a look at some of the best purchases you can make this weekend. Firstly, Free People’s sale is an extra 50% off this weekend. Free People is doing very well as a company yet they rarely do sale cuts this deep, so this is quite a treat! You’ll find sale available from every section of their site, from sale intimates to sale dresses and so on. Most items are only available in limited sizes and color options which is to be expected with such a delicious promo happening. A few items that I own made it to this sale, including the wonderful Seaside Denim Midi Dress (now $100 + 50% off). You may not connect denim + hot weather. However, this dress is such a lightweight denim and its open back makes it perfectly breathable in the heat. This has been one of my most-reached for brunch dresses this Summer and it never fails to win tons of compliments. The Florence Maxi Dress (now $230 + 50% off) is another popular weekend dress in my social circle; it was a bit too overpowering for me but I did recently invest in the beautiful Tropical Sunrise Maxi Dress ($228) that’s still full price. You’re safe to size down in any of these three dresses as they all run big. Also in my closet and in this sale is the FP One Mechanics Romper (now $70 + 50% off). Yes it’s a romper but it’s one of the cutest rompers I’ve ever owned! I have it in the white — err, pardon me, ecru — and I’m thinking of buying the railroad stripe version now. Another love of mine is the Constance Sleep Shirt (now $50 + 50% off) that is at a much more reasonable price point than its original $128. Below, more of my picks from Free People’s excellent weekend promotion. Anthropologie is hoping a plethora of weekend promotions will entice us to shop! To begin this weekend Anthro loyalty members can take 20% off their full-price purchase. There is literally tons of new stuff to choose from — 10 pages worth! Most of it just makes me shrug but there are a few beauties hiding within the fug. The Cheri Pleated Skirt ($98 + 20% off) will be fun to wear now with color and come Fall it will be equally fun to surround with black and grey. The Zebra Romper ($138 + 20% off) looks adorable although the lone review is quite eeeek. Tall like me? Then you’ll love the Tulip Maxi Dress ($188 + 20% off), one of the few Anthro items I’ve tried lately that fits like the old stuff used to. (In other words, great!) I loooooove the print of the Cherry Blossom Pencil Skirt ($198 + 20% off) but god how I wish it hit across the bottom of the knees instead of above them. And if no clothing is appealing to you, you might want to head over to the newest accessories instead. Or sale, where home is an extra 40% off and clothing is an extra 25% off. Below, my picks for the 20% off Anthro Day Weekend promotion; clothing is on top and accessories are on the bottom. My favorite leggings (also available in moto leg). Finally, the Nordstrom Anniversary Sale is now open to the public! While some items from my early access order have now sold out there’s still plenty of great items to choose from. My top choice is probably the Caslon Utility Jacket (now $50), a cute camo jacket with a bit of pink stitching adding a nice feminine touch to the piece. I’m also in love with my new Sosken Double Breasted Plaid Coat (now $465), an investment coat that will be in my closet for years. Also, not in the Anniversary Sale but I did want to mention that my favorite WAYF cami is now on sale in both colors I own! On me here and here. Below, 20+ pieces you’ll actually wear from the Nordstrom Summer 2018 Anniversary Sale. What sales are you shopping this weekend? Next Post Ssshhh: Shop the Madewell Fall 2018 Collection First! I wasn't impressed with the Nordstrom sale at all this year. 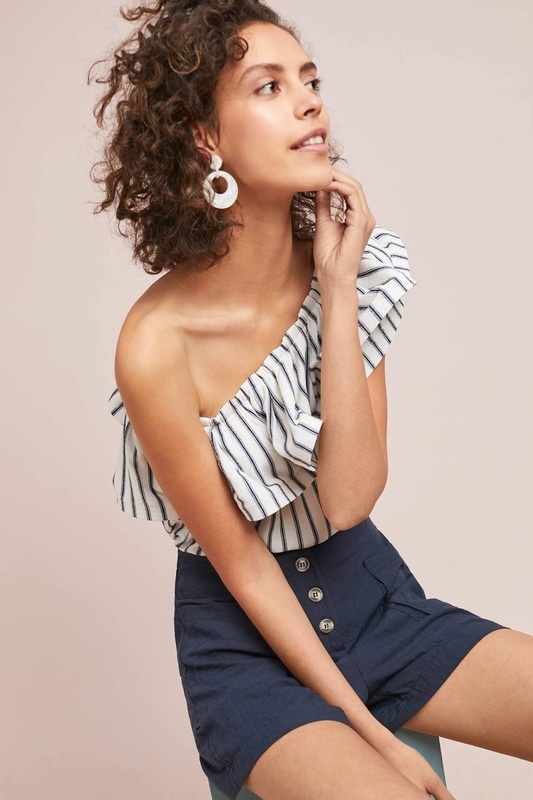 The one thing I was really drooling over, this Joie blouse: https://shop.nordstrom.com/s/joie-latacia-bell-sl… was still too expensive, even with the discount. (and then it sold out and I had a double excuse, lol). I'll be sitting this one out. Which is a good thing, because….. I write them a lengthy email yesterday! I ordered the menorca kimono FOUR times-the first three times were at the price of 53.97 and ship to store so no shipping charge, the 4th was not available for ship to store so I paid shipping and a higher price. Guess which one shipped? The last one! Even though I had three unfulfilled “ backordered” orders for the same exact item that had not been cancelled yet. I asked for a refund to my account for not only the shipping but the difference in price. And I lamblasted them for their awful shipping and fulfillment practices. I have yet to hear back. Hi Anthropolitan. Just wondering if you got the rest of your swag and what you liked best. I am still waiting for my orders to arrive. I am particularly curious about the black swan maxi dress. Looks gorgeous! I am not a fan of FreePeople. It doesn't flatter me at all. I would have to order two of them. I bought the Caught Your Eye maxi in white at free people for a white party we have in August. Still waiting for a ton of my ship to store orders to arrive from anthro- so no full price with 20% off buying for me. I did finally order the liberty bedding I’ve been listing after at 40% off-a steal at $215 when originally $600! It better ship!! And I never buy anything at nordies sale because I can’t wear most of it now anyway and would rather just wait for SALE sale. I do like looking at the upcoming fall trends though. I have found that a lot of stuff from the Anniversary sale ends up getting marked down really early in the season; for equal or sometimes even better savings. For me, this sale is only for must-haves or things I'd be sad to miss out on if they sold out. Otherwise, it's mostly just for the fun of having first dibs on new stuff. Fun to have a look, though, I agree! Yes! I just can’t look at blazers sweaters and jeans when PA is having 90% humidity! Thanks so much for pointing out the Caught Your Eye dress! My friend had been looking for a dress for a white party rehearsal dinner for a month and thought she’d never find anything she liked. She instantly loved this dress when we went to our local FP and can’t wait for the dinner!! I hope it fits-I’ve already bought and returned 4 white dresses that just weren’t right! Lucky that she was able to score it in-store-my store last week only had a bunch of size twos and I’m not anywhere near that tiny! If you’re anywhere near, the Short Hills store had a few size 4-12’s in stock today. I went nuts with free people too…jeffrey campbell grove lace (two booties blue tapestry and pink version). A suede dress. White jeans with beautiful embroidery. Adella bralette (3 of them). And now the Peach Pie Midi Dress that i found in store under 50% off onesie rack. Everything I got was 50-80% off and I love everything I bought. Super stoked. And anthro? I ordered and I called to cancel. One shipped out and was returned promptly. I did buy two things in store and they were on sale with an additional 40% off a few weeks ago. I normally spend hundreds during each tag sale but I spent less than $80 this time. I went a little crazy at Free People too. I was on their website again today (embarrassing to admit) and noticed that on the sale items it said 50% off and that all sales were final. I am worried about the sizes and would not have ordered one of the more expensive items had I seen this. Did anyone else see that it was final sale yesterday or could that have just been added today? The sale items did not say 50% off when I bought them, and I checked the site and email. They had better honor that!!! I know. I hope so too. I thought that perhaps I just hadn't noticed when placing my order. I called FP and they assured me that they would honor what it said on the day I purchased so fingers crossed. I also bought the same dress as you (looks gorgeous!) and hoping that it fits. They were out of the small so I ordered the x-small. I am usually an x-small with FP but sometimes a small. I ordered a suede jacket in a small hoping that I can fit a sweater underneath. The sizing always seems to be a bit of a crap shoot. I know they are not the best quality but I actually love the BP sweaters they have on sale in the $30 range. They are a great compliment to my more expensive ones and it they last a season or two then I am ahead. I also love the sosken double breasted coat Roxy mentions but it runs extremely large so take that into account if considering. Anyone else getting stopped from browsing the Anthro site with endless I'm not a Robot pages? I only have time to browse a little at a time, so I leave the page open, but when I come back it is the same ridiculousness. And Anthro is paying a lot of money for this service!!! I'll be in one of the DC Nordstrom's to shop for shoes in person, and may have time to visit the new Anthro & Co store that reopened in the old Georgetown location. Neither Nordstrom not FP sales were of interest to me. As for Anthro I do love the Majolica blouse, as the fit and style are nice. It is poly though, and I'm hesitant to give them any of my money right now. I'm still pretty mad about them not having PA for extra 25%, even when it hasn't shipped out yet. I returned everything I ordered and reordered the one pair of shorts I liked. New Price adjustment policy is terrible. Agreed. Anthro gets no more of my money. The new price adjustment policy is ludicrous.